While you may already know that a good plywood subfloor adds support to your home, you may not be aware that reinforcing joists with plywood can add structural integrity. If you notice that one or more joists are squeaking, or if you’re starting to feel some bounce when walking, it’s time to get to work. Plywood is a strong laminate composed of several thin layers of heavily compressed wood glued together. Some people consider it to be inferior to standard lumber, but the opposite is almost always true! A quality piece of plywood is typically stronger than the corresponding amount of standard wood. In the event a joist is cracking or sagging, it needs to be repaired quickly. 1. Measure the distance from the bottom of the floor to the bottom of the joist. This measurement is typically between six and eight inches. 2. Measure the length of the beam. 3. Cut four strips of one-inch plywood to the width of the first measurement. Be sure to cut in the direction of the long side (usually 8 feet). 4. 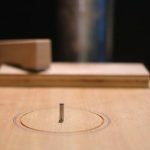 Drill ¼-inch pilot holes at six-inch intervals down both long sides of each plywood board. 5. If the joist is cracked or is markedly sagging, you will need to use a hydraulic jack to raise it. Put a heavy 6×6 block wood beneath the jack to support it. 6. Measure the distance from the bottom of the sagging beam to the top of the jack. 7. Cut a 4×4 piece of lumber to span the distance measured. 8. Place the 4×4 between the beam and the jack. It should be a snug fit. If not, raise the jack slightly. This is often easier with a helper to position the 4×4. 9. Jack the joist up very slightly. This process can be a lengthy one, as you should jack at a rate of no more than ¼ inch per day. Jacking more than that can damage drywall or walls in the house. 10. 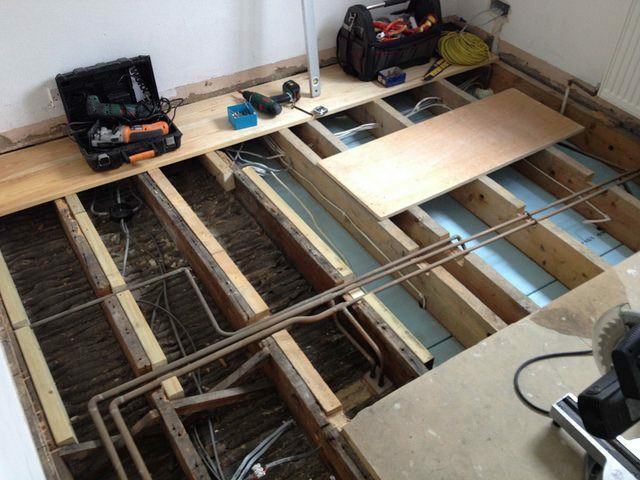 Once the joist has been appropriately straightened, it’s time to get back to the process of reinforcing with plywood. Begin by applying construction adhesive to the face of one of your plywood boards. Position the board against one side of the joist. Use clamps to keep it in place. 11. Apply adhesive to the face of the next plywood board and secure it to the first plywood board, repositioning your clamps. Be sure that your pilot holes are lined up. 12. Drill through the first pilot holes, into the joist. Insert lag bolts into the pilot holes and tighten them into the joist with a ratchet and socket. 13. Repeat steps 10 through 12 on the other side of the joist. Some crawlspaces are not DIY friendly. You can still reinforce joists and eliminate weak or squeaky areas by accessing the joists from above. To do this, you will first need to remove the surface flooring. Either save the flooring for re-use or plan to redecorate. Once the flooring is up, you’ll be able to see the subfloor. 1. Identify squeaky spots by carefully walking the floor. Mark the squeaky spots for further investigation. While investigating the subfloor, look for signs of dampness or rot. Poke suspect areas with something sharp to see if they feel mushy. Now is the perfect time to make repairs and solve problems that are causing issues, so be thorough in your investigation. 2. If damage is extensive, get in touch with your homeowners insurance agent before doing any more work. You may need to file a claim. 3. Once you’ve marked all the bad spots, draw chalk lines so you’ll know where to cut. Any cuts you make parallel to floor joists need to be down the nearest joist’s center line. You have to have a way to attach new plywood to reinforce the joists. 4. Use a circular saw to remove damaged areas of plywood, setting your blade to 1/8 inch deeper than the thickness of the plywood. Are there a lot of problem spots? You might save yourself some time and effort by prying up entire pieces of damaged subfloor and replacing them instead of cutting lots of holes. 5. For areas close to walls where your saw can’t reach, use a hammer and chisel to cut through the damaged wood. 6. Inspect the joists underneath. If they appear to be sagging, you may have to bite the bullet, go under the house, and follow the instructions for bracing joists with plywood above. Luckily, you can do part of the work from above. Once any problems have been addressed, you can move on with installing new subfloor for patching damaged spots. 7. Plywood usually comes in 4×8 foot sheets, although some venues carry different sizes. Choose the same thickness as the existing subfloor and purchase enough to account for all the damaged areas, plus a little extra in case you’ve mis-measured. 8. Measure all the damaged areas and cut the new plywood subfloor accordingly. You want a nice tight fit. 9. Before setting the new plywood in place, apply a layer of construction adhesive to the upper portion of the joist. 10. Next, screw the plywood into place. Drywall screws work well for this. Place the screws at four-inch intervals to add strength. 11. Lay a bead of construction adhesive into the joints between the plywood panels. This will add strength and help prevent future problems. 12. Re-install the finish floor. While these tasks can be labor-intensive and time consuming, reinforcing joists with plywood protects your investment in your home. Doing it yourself will save money – even if you purchase the best plywood, screws, and construction adhesive available.